Portable Generators are used to generate electric power in domestic, commercial, and industrial applications. Generating electricity for live commercial events, electrifying machinery in construction sites, additional power supply during power outage, and others are the applications covered in the study. The global portable generators market is analyzed across North America, Europe, Asia-Pacific, and LAMEA. The leading vendors in the market have adopted product launch as their key development strategy to attain major market share and diversify the product & service portfolio and sustain intense competition. In addition, companies have also adopted partnership strategies for implementation of new technologies, improvement of operational performance, and market expansion & innovation. The global portable generators industry, is segmented based on fuel type, power output, application, and geography. Based on power output, the market is bifurcated into less than 3kW, 3-10kW, and more than 10kW, while the application segment consists of domestic, commercial, and industrial. Based on geography, the portable generators industry is analyzed across North America, Europe, Asia-Pacific, and LAMEA. North America generated the highest revenue in 2015. The global market for portable generators industry was valued at $3,146 million in 2015, and is estimated to grow at a CAGR of 6.6% to reach $4,913 million by 2022. 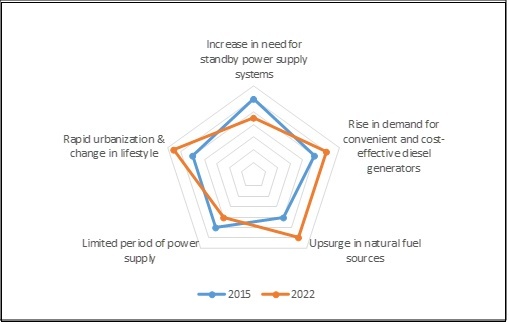 Increase in need of power backup facility, growth in demand for low-cost and diesel-fueled generators, increase in preference for natural gas-fueled generators, and rise in awareness of portable generators drive the market. However, the portable generators market growth is restrained due to limited duration of power supply and stringent environmental regulations toward emission of hazardous gases from diesel generators. The power output segment includes less than 3kW, 3-10kW, and more than 10kW power generators. Increase in adoption of multipurpose power generation systems is anticipated to fuel the portable generators market growth. The less than 3kW portable generators segment is projected to grow at the highest CAGR, owing to increase in awareness of in-house power backup and rise in need for portable powering systems in outdoor recreational activity. The generators that deliver more than 10kW power are extensively used in industrial sector due to need for higher power supply to run machines and industrial tools, which in turn is expected to drive the portable generators market. Asia-Pacific is the leading regional market, in terms of growth rate, for portable generators, owing to rapid industrialization in developing countries such as China, Japan, South Korea, and India. Moreover, rapid industrialization in Latin America and Gulf countries is expected to fuel the demand for portable generators, as these generators are utilized in various construction activities, which include cutting, drilling, lifting, and many others. Easy availability of fossil fuel in Middle East region is one of the key growth factor for portable generators in the region. Key players profiled in the report are Generac Power Systems, Inc., Cummins Inc., Briggs & Stratton Corporation, Honda Motor Co., Ltd., Caterpillar, Inc., Eaton Corporation Plc, Kohler Co., Yamaha Motor Corporation, Champion Power Equipment, Inc., and Smarter Tools, Inc. The report discusses the key strategies adopted by the companies in addition to the current trends, upcoming opportunities, and restraints in the market growth, with detailed information about their impacts. Natural gas-fueled generators gain traction with the evolution of stringent environmental norms to control embosom of hazardous gasses from diesel generators in developed regions such as North America, Europe, and some parts of Asia-Pacific. In addition, many developing nations such as India, Singapore, and Russia use natural energy sources in generators, hence providing a good space for market growth. Portable generators gain traction among end users, including house owners, event organizers, third-party service providers, and others, owing to increase in need for energy backup during power outage, convenient power storages for camping, and long outdoor events at distant places. Several key players in the market support commercial events with their wide range of product category. Stringent environmental regulations toward emission of hazardous gases, such as carbon monoxide, carbon dioxide, nitrous oxide, and others, from generators hamper the growth of the market. Several regulatory bodies such as the California Environmental Protection Agency, United States Environmental Protection Agency, Central Pollution Control Board (India), and others have set guidelines to restrict hazardous pollutants from diesel generator exhaust systems. The report provides an overview of the trends, structure, drivers, challenges, and opportunities in the global portable generators industry. Porters Five Forces analysis highlights the potential of buyers & suppliers, and provides insights on the competitive structure of the market to determine the investment pockets in the portable generators market. Current and future trends adopted by key players are highlighted to determine overall competitiveness of the global portable generators industry. 8.3. CHAMPION POWER EQUIPMENT, INC.
8.6. GENERAC POWER SYSTEMS, INC.
8.7. HONDA MOTOR CO., LTD. The global portable generators market size was $3,146 million in 2015, and is estimated to reach $4,913 million by 2022 at a CAGR of 6.6% during the forecast period. Increase in need of standby power supply systems, rise in demand for convenient and cost-effective diesel generators, increase in preference for natural gas fueled generators, and growth in awareness of portable generators among end-users including house owners, event organizer, third-party service providers and others drive the global market. 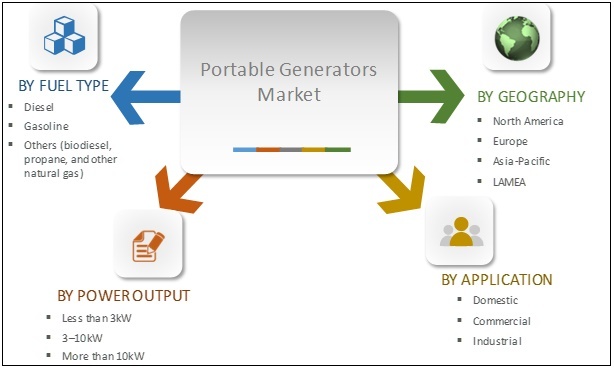 However, the factors restricting portable generators market growth include limited duration of power generation and harmful carbon emissions generated by diesel generators. The adoption of portable generators has increased in domestic and commercial applications over the years. Commercial events of mass gathering in under-developed and developing regions including Asia-Pacific, Latin America, Middle East, and Africa demand additional power generating portable generators due to interrupted electric supply networks and regular power outages. In addition, portable generators are on high demand from recreational activists, travelers, and county side tourists for need of power at remote places. The leading players profiled in this report are Generac Power Systems, Inc., Cummins Inc., Briggs & Stratton Corporation, Honda Motor Co., Ltd., Caterpillar, Inc., Eaton Corporation Plc, Kohler Co., Yamaha Motor Corporation, Champion Power Equipment, Inc., and Smarter Tools, Inc. These companies have adopted strategies such as business expansion, product launch, and merger & acquisition to increase their market shares and expand their geographical presence. Portable generators offer power need in multiple application areas including domestic, commercial, and industrial. The variable nature of portability gives right choice to the end-users fulfilling their power need in both in-door and out-door activities. However, the demand for standby and battery power inverters is at a steady rise, which is expected to challenge the portable generators market growth in the coming years.